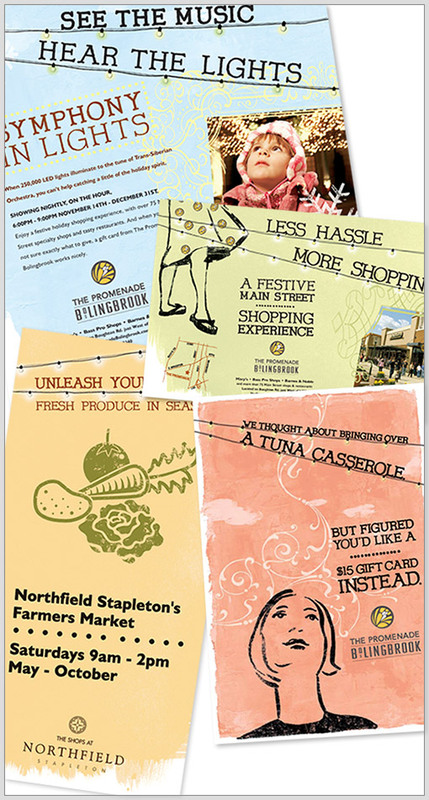 The Shops at Northfield Stapleton and The Promenade Bolingbrook are large open-air shopping districts featuring specialty shops and restaurants and are owned by Forest City Enterprises—an American diversified real estate management and development company based in Cleveland, Ohio. Northfield Stapleton is located in Denver Colorado, while the Promenade Bolingbrook is located in Bolingbrook, Illinois, a southwest suburb of Chicago. TRUE creative services was awarded a six-year project to maintain a high-profile advertising campaign—consisting of on and offsite signage, as well as both web and print marketing collateral—to provide a consistent and frequent source of new ideas and visual concepts while adhering to the previously established branding and campaign.